L.A. Conservancy Curates: Modern Architecture in L.A. If you're an architecture lover, an urban planning fanatic, or someone interested in learning a little more about Los Angeles, don't miss some of the upcoming events hosted by the L.A. Conservancy that are part of their new program Curating the City: Modern Architecture in L.A. The program will include architectural tours, panel discussions, youth activities, and a classic film screening that will explore Los Angeles's modern architectural heritage from a period spanning from 1940 to 1990. 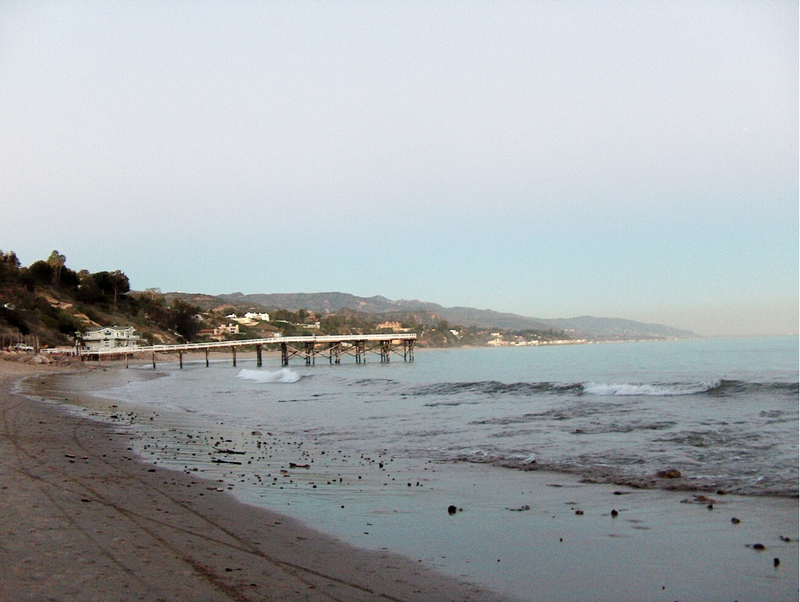 The idea of this program is to treat the Greater Los Angeles area as a living museum. Starting in May and continuing through June, every Saturday, the L.A. 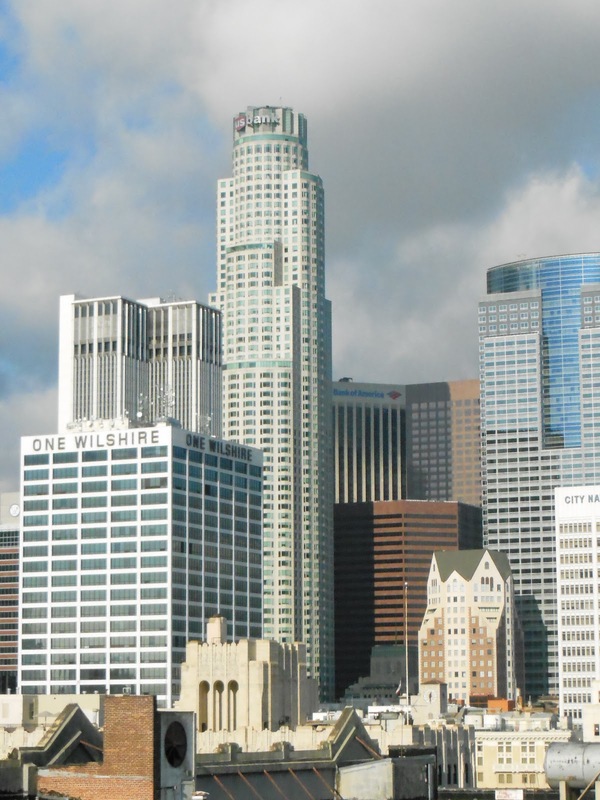 Conservancy will be leading tours around downtown Los Angeles, highlighting skyscrapers, plazas and public art in the area known as Bunker Hill. During the tours docents will share stories about Bunker Hill's transformation and show how the area mixes the old with the new. Classic movie fans who enjoy film noir may enjoy learning more about the Bunker Hill neighborhood, an area featured frequently in classic film noirs. 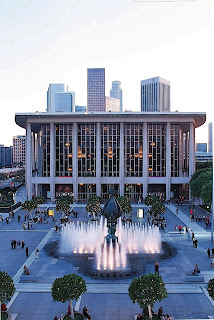 One event I'm particularly interested in is a film screening of My Fair Lady being held at the Dorothy Chandler Pavilion. 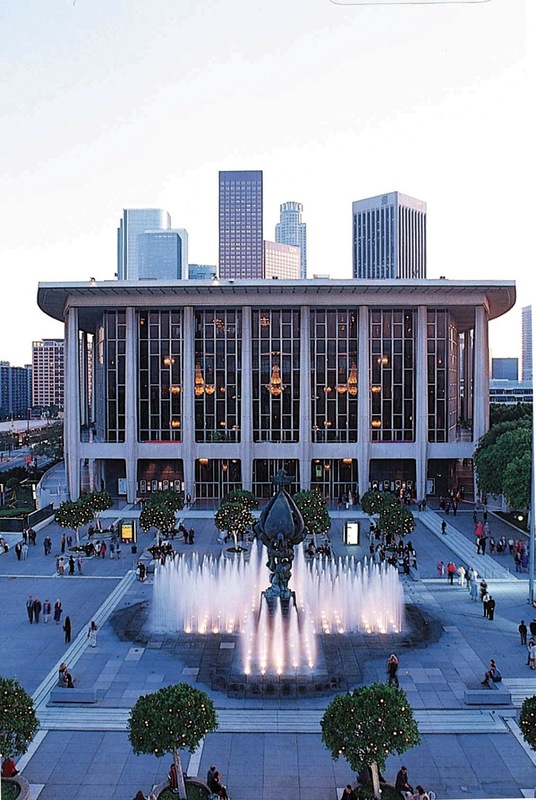 My Fair Lady was released in 1964, the same year that the Dorothy Chandler Pavilion opened. This screening takes place on Wednesday, June 12, at 8p.m. To learn about all of the upcoming events, dates, times, pricing and other details, visit the L.A. Conservancy website. This past Thursday, my wife Zinnia and I were attending the film premiere for Love in the Time of Monsters, a campy, horror comedy (more on that in another post) at a theater in downtown Los Angeles. Afterwards, we made our way to the after-party which was happening at The Edison, a prohibition era themed nightclub located in a building that was once downtown LA's first private power plant. Stepping into The Edison is an experience in itself, like attending a roaring 20s party thrown by Gatsby. What was extra special this time and a total surprise, was entering The Edison while the band The Dustbowl Revival was performing. 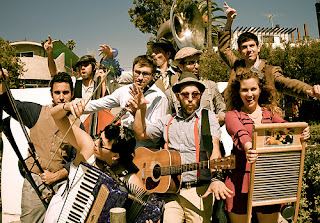 I know this may seem a little off subject from my usual classic movie related posts, but classic movie lovers who, like me, enjoy all things retro and old fashioned, will likely enjoy the throwback sounds of The Dustbowl Revival. The song Zinnia and I first walked in on was a very old-timey sounding jazz number that was very appropriate for The Edison's ambiance. The more we heard, the more we felt like we were transported back in time. 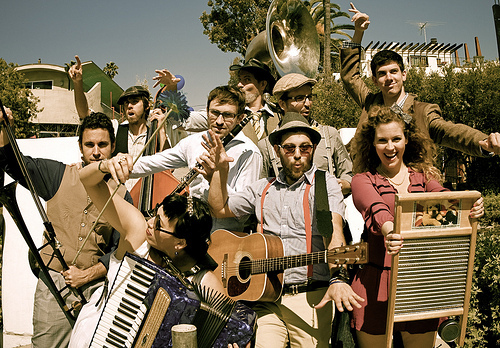 The Dustbowl Revival, a Venice, California-based band, brings to life many styles of early 20th-century American music including bluegrass, Dixie-jazz, jug-band, gospel and 1930s hot swing. The large group of musicians even utilizes some old fashioned instruments, like a washboard or a kazoo that they mix with more traditional instruments like guitar, trombone, clarinet, stand up bass, drums, mandolin, violin and several other instruments. Here is a video of The Dustbowl Revival performing their song, "That Old Dustbowl" (note: there may be short ad that plays before the video starts). I am a little late in discovering The Dustbowl Revival - they already have a few albums out - but I'm glad I discovered them when I did. The band put on a good show at their record release and I cannot wait to see them play live again, which will hopefully be soon. The group has a few more LA based shows before they go on tour. For LA folks, the band will be playing this Sunday (April 21, 2013) at the Los Angeles Times Festival of Books and in May the group will be playing Wednesday nights at The Mint. To learn more about The Dustbowl Revival or to see if they will be on tour in your area, visit their official page here. 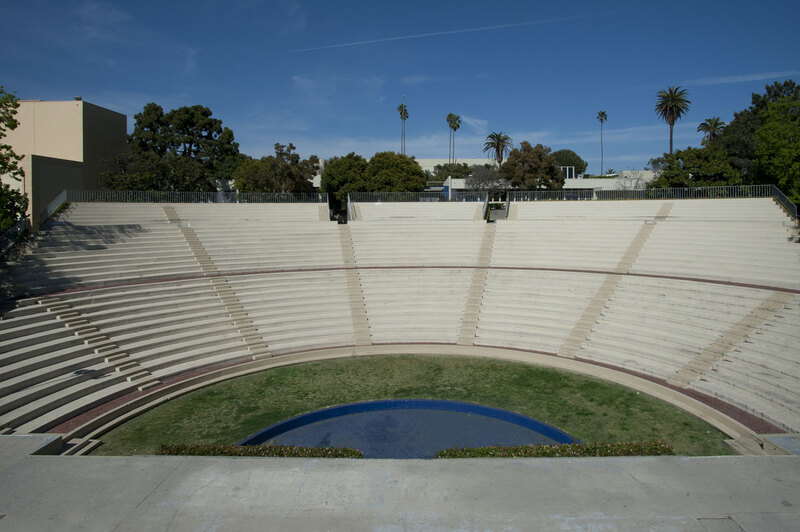 In less than two months, Santa Monica High School seniors will be participating in their graduation ceremony at the Memorial Greek Amphitheatre located on the campus. 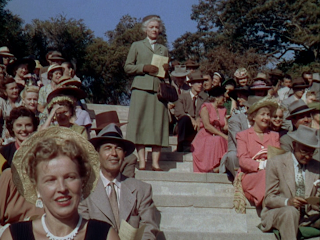 This is the same theatre in which Myrna Loy, in the film Belles on Their Toes (1952), joyously watched her youngest daughter's graduation ceremony. 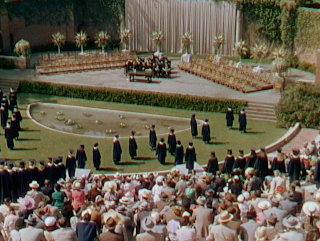 Although there have been some dramatic changes to the theatre during the last 61 years since the film was made, the Memorial Greek Amphitheatre is still very recognizable. 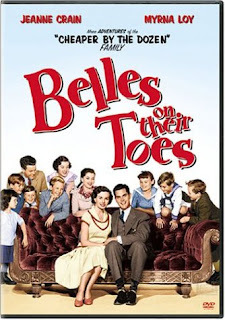 Belles on Their Toes is the sequel to the original Cheaper By the Dozen. In Belles, Loy, the mother of twelve children, continues to look after her family, but now without the help of her husband who had passed away at the end of the first film. You would expect the film to focus on Loy and the difficulties of a single woman raising twelve kids, but instead the film is centered more on the teenage romances of the older daughters. 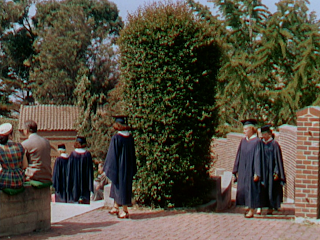 The film begins with Loy, done up in makeup to appear older, attending the graduation ceremony of her last child and then the story jumps back in time to show events preceding the graduation. Note: Click images to see larger. 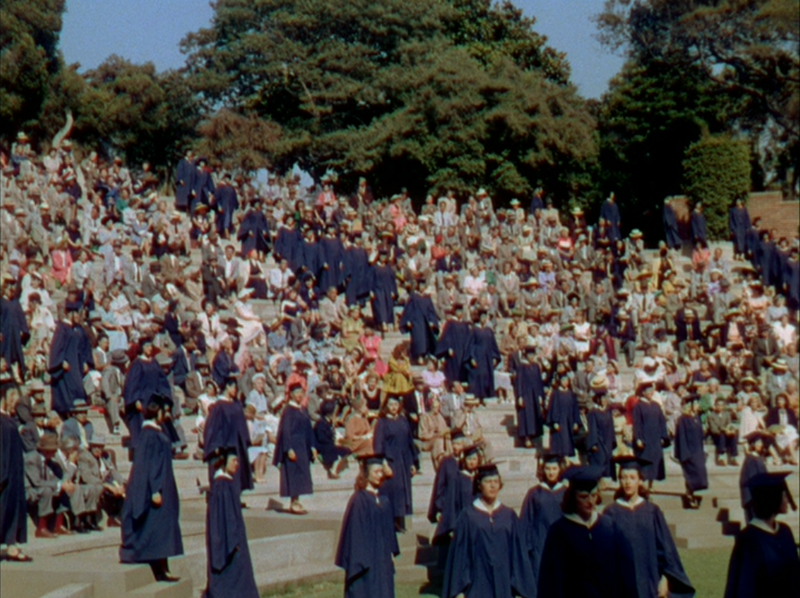 Graduates walk the steps of the Memorial Greek Amphitheatre at Santa Monica High School in the film Belles on Their Toes. 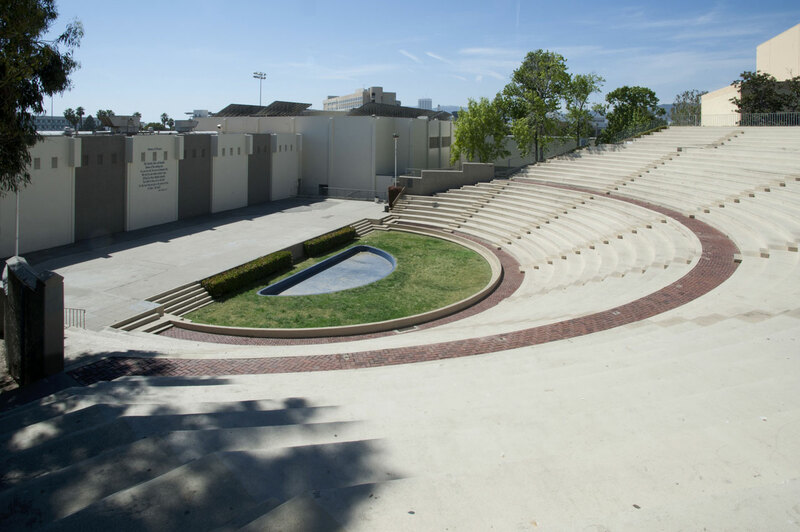 A contemporary view of the Memorial Greek Amphitheatre at Santa Monica High School. 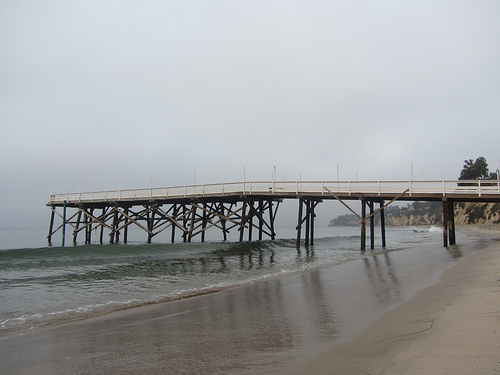 Photo from Santa Monica-Malibu Unified School District. Memorial Greek Amphitheatre as it appears in Belles on Their Toes. The outdoor Greek style amphitheatre was originally built in 1921 to honor Santa Monicans that had served in World War I. Plaques on the walls of the amphitheatre listed all of the Santa Monicans that had served in the war. In the 1950s, a second level was added to the Greek, which you will notice by looking at the comparison of the screenshot and contemporary images below. Other additions to the theatre since it first opened in 1921 include plaques honoring Santa Monicans who have served in every major military conflict, as well as one for a student who was killed because of gang violence in the early 2000s. 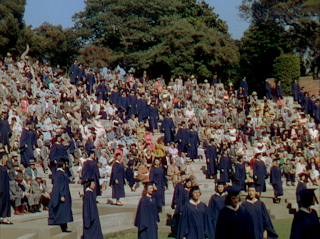 The Memorial Greek Amphitheatre first hosted a graduation ceremony in 1921 and has every year since. The Memorial Greek Amphitheatre in Belles on Their Toes. Contemporary view of the Memorial Greek Amphitheatre in Santa Monica. Myrna Loy on the steps of the Santa Monica High School Memorial Greek Amphitheatre as seen in Belles on Their Toes. 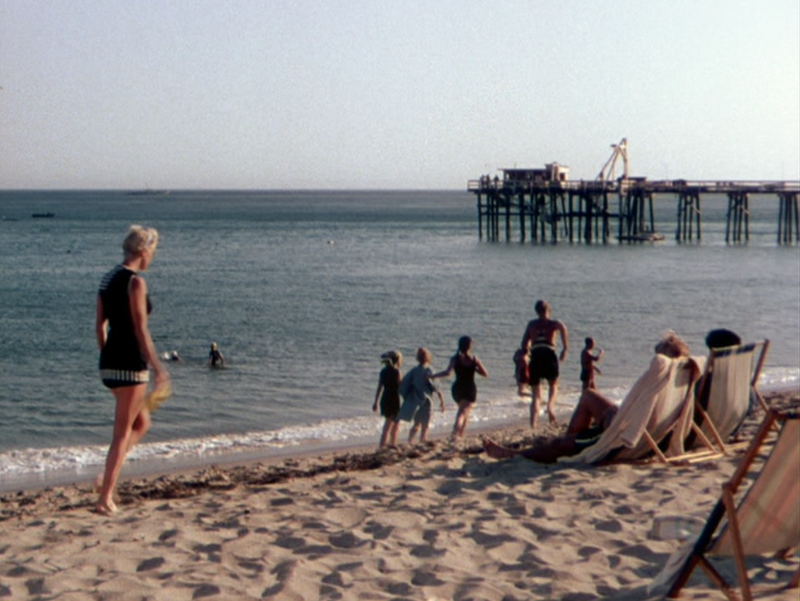 Most of the scenes in the film were shot on the 20th Century Fox Studios lot, with the exception of the graduation scene which was filmed on location at Santa Monica High School, and another scene that was filmed on location at Paradise Cove in Malibu. 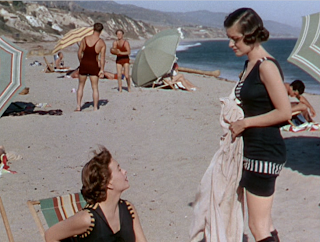 In the scene below the kids spend a day at the beach and two of the teenage daughters try flirting with the local boys. Minus the vintage bathing suits and umbrellas, this stretch of coastline is pretty much the same quiet beach area. Paradise Cove, Malibu, Ca as seen in Belles on Their Toes. 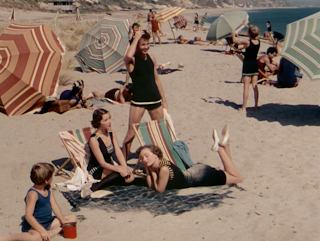 Don't you just love those bathing suits? 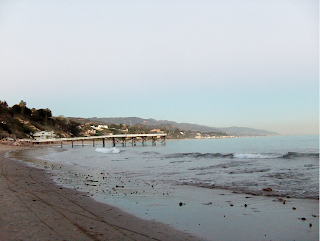 Paradise Cove, Malibu as seen in Belles on Their Toes. In addition to Myrna Loy, the Belles on Their Toes cast includes Jeanne Crain, Debra Paget, Jeffrey Hunter, Edward Arnold, Hoagy Carmichael, and Verna Felton who voiced many Disney characters. Belles on Their Toes was directed by Henry Levin. The film is available on DVD and can also be rented through ClassicFlix.